Starring: Paul Rudd, Michael Douglas, Evangeline Lilly, Corey Stoll, and more. It is undeniable that Marvel Studios and the superhero era of movies is on a sprint for the gold medal when it comes to hit blockbuster movies. Some would say that they are the westerns of our generation. Iron Man repulsor rayed through the Hollywood gate. Captain America humbled crowds, drawing large audiences to the red, white, and blue hero. Guardians of the Galaxy shocked legions as it brought huge attention to a “bunch of A-holes” in Marvel’s riskiest of ventures and now comes Ant-Man, one of the most unconventional heroes to hit the big screen. The story of Ant-Man begins with Scott Lang (Paul Rudd) getting out of prison after serving a sentence for a previous crime he committed. Upon his freedom he meets up with old cell-mate, Luis (Michael Peña), who gives him a place to stay as well as an offer to do a heist job which Scott quickly refuses due to him wanting to take care of his daughter and become the father/hero she sees him to be, but that is easily said than done for ex-convicts. Scott struggles to find a consistent job and soon succumbs to taking up Luis on his job offer due to needing quick cash. 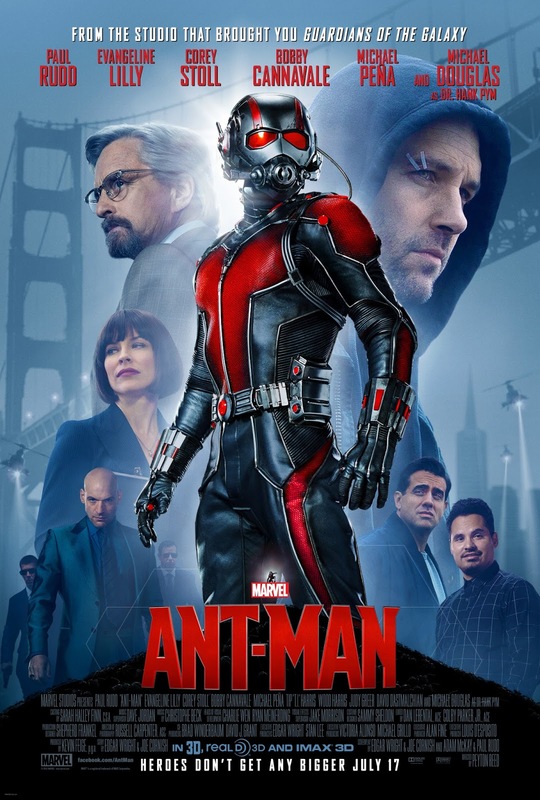 Little does Scott, Luis, and company know, the job is a set-up by Dr. Hank Pym (Michael Douglas) and his daughter Hope van Dyne (Evangeline Lilly) for an even bigger heist with much more at stake than getting some quick score. The bigger story taking place follows Hank Pym’s mission to keep his Ant-Man suit a secret from the world because he feels if the suit gets in the wrong hands, chaos would surely ensue. This threat is especially prevalent in the means of his former protégé, Darren Cross (Corey Stoll), being manically obsessed with replicating the suit and equipping an army with said suit for profit, and once he is successful with making the suit and replicating the “Pym Particle” which powers the suit, Dr. Pym becomes hellbent on seeing his mission through which is destroying Cross’ suit, destroying his particle stockpile, and ultimately saving the world from chaos. Ant-Man was a breath of old but new fresh air. To me it feels like a present day Marvel Universe, phase one movie. What I mean by that is it was an introduction movie like Iron Man, Captain America, Hulk, and Thor alike, yet it was set in the present day of the Marvel Universe. So, post events of Age of Ultron. To me, I thoroughly enjoyed this film. Paul Rudd played Scott Lange brilliantly, embodying the sarcastic joker that Ant-Man is known for yet still playing the role of a loving and caring father. The comedic point of this movie was on point where I found myself laughing at every line Scott would belt out and especially Michael Peña’s character of Luis. Actually, the entire heist crew was an all around riot to witness on screen between Rudd, Peña, T.I. (Dave), and Dastmalchian (Kurt). Comedy aside, the action was just right for how I like my superhero movies. The effects were brilliant to me and this film was one of my favorite 3D movies to date. Overall, an enjoyable film as Marvel continues to knock movies out of the park and continues to make the inner comic geek in me so happy with characters I have grown to love and continue loving in their new present day adaptations. Welcome to the universe, Ant-Man.